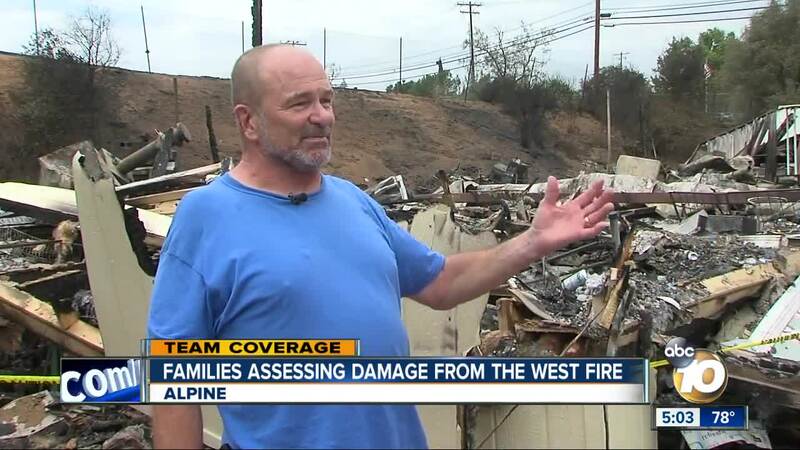 ALPINE, Calif. (KGTV) -- Residents are beginning to return to their homes in Alpine after the West Fire tore through the area, scorching hundreds of acres and destroying dozens of homes. In total, the blaze burned 505 acres and destroyed 34 homes and 22 other buildings, including a commercial structure. As of early Monday evening, the fire was 95 percent contained. The blaze was first reported around 11:30 a.m. Friday off Interstate 8 and West Willows Road. The flames quickly spread to the Alpine Community. Two firefighters were also injured in the blaze. The first suffered slight burns to the face while the second suffered heat-related injuries. The West Fire wasn’t like most fires that have torn through San Diego and was scattered between homes and over hills, said Cal Fire Capt. Kendal Bortisser. Crews remained on scene over the weekend as triple-digit heat plagued the area. Cal Fire said late Sunday evening that they would remain on scene and continue to update the public until the fire has reached 100 percent containment. Also Monday afternoon, the County Department of Animal Services said, of the approximately 30 animals displaced during the West Fire, all but four have been reunited with their owners. Staff are also helping people impacted by the fire with pet food and resources at the Alpine Local Assistance Center. “Unfortunately, we have a lot of experience with this, so we can jump into action, and all went smoothly,” said Dan DeSousa, director for the County Department of Animal Services Department. The cause of the West Fire is under investigation.